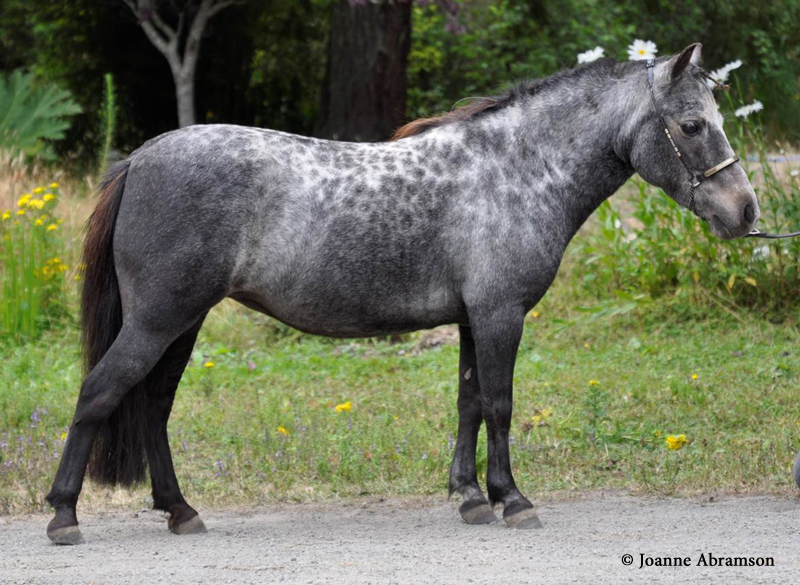 I wanted to get pictures of one of the new horses at our barn, Dutch, to use for a post on sooty patterns. 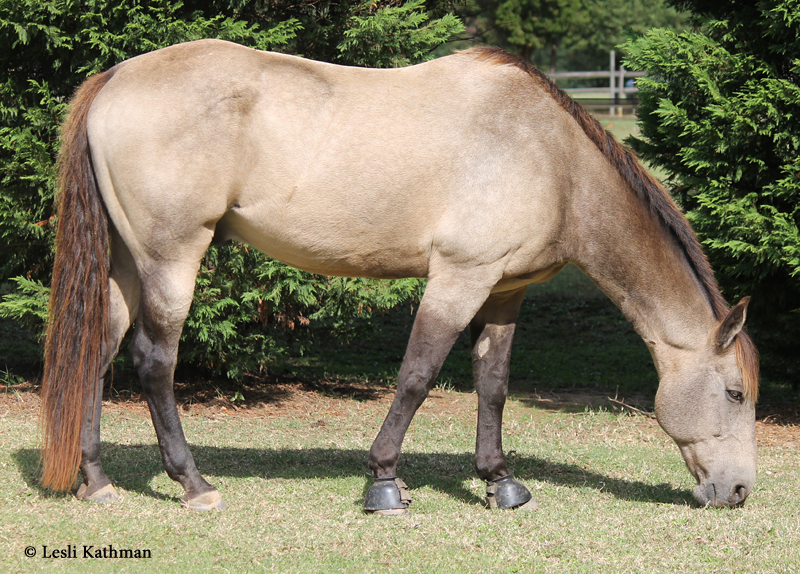 Dutch was interesting because he has the very dark forehand that some sooty buckskins get. I also thought artists that read the blog might find the abrupt transition between his body color and the black front legs interesting. I had only seen Dutch at a distance, but I had gotten the impression he had somewhat paler-than-usual eyes. 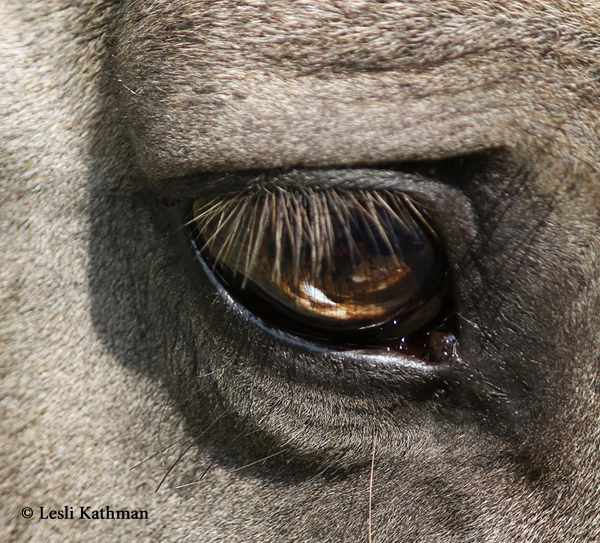 Light brown eyes are not uncommon in buckskins or palominos, so that would not have been unexpected. When I got close enough to take this picture, the reflection from his eyes looked off. (All the images in this post are larger than they appear, and since the details are small, I highly recommend clicking them to see the larger version.) Instead of looking pale brown, his eyes looked like the reflective gleam was in the wrong place. That is more noticeable in this face shot. 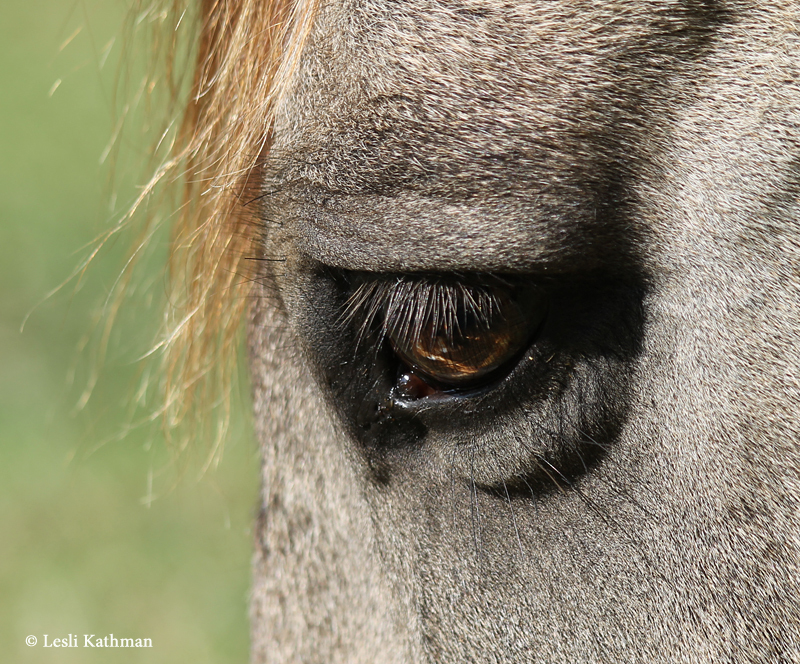 Over the years I have learned that odd reflections in the eyes sometimes mean the horse has a blue segment, and sure enough, that was the case with Dutch. 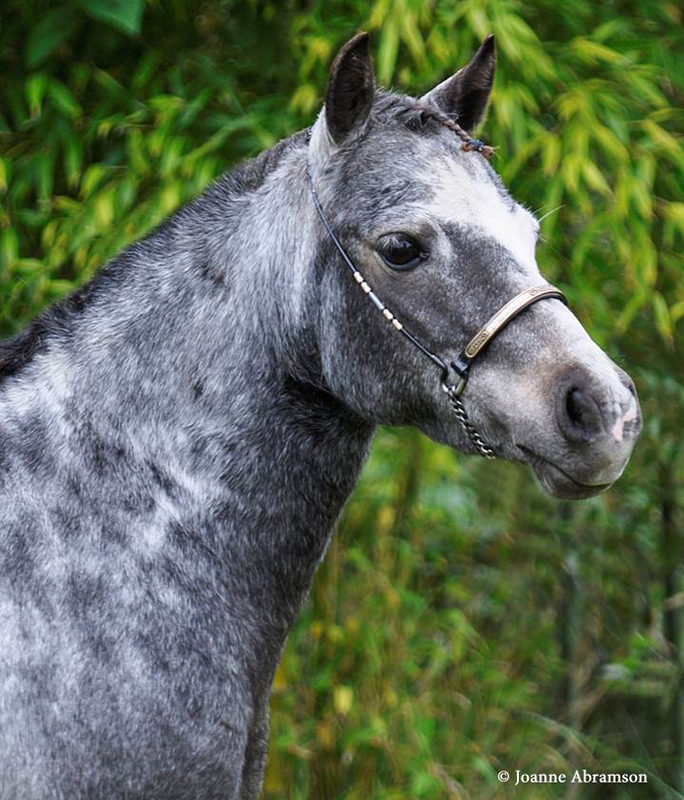 Although he has no white markings at all, both of his eyes have flecks of blue. The largest one is located close to the bottom of his right eye, and is what is giving the odd reflection. 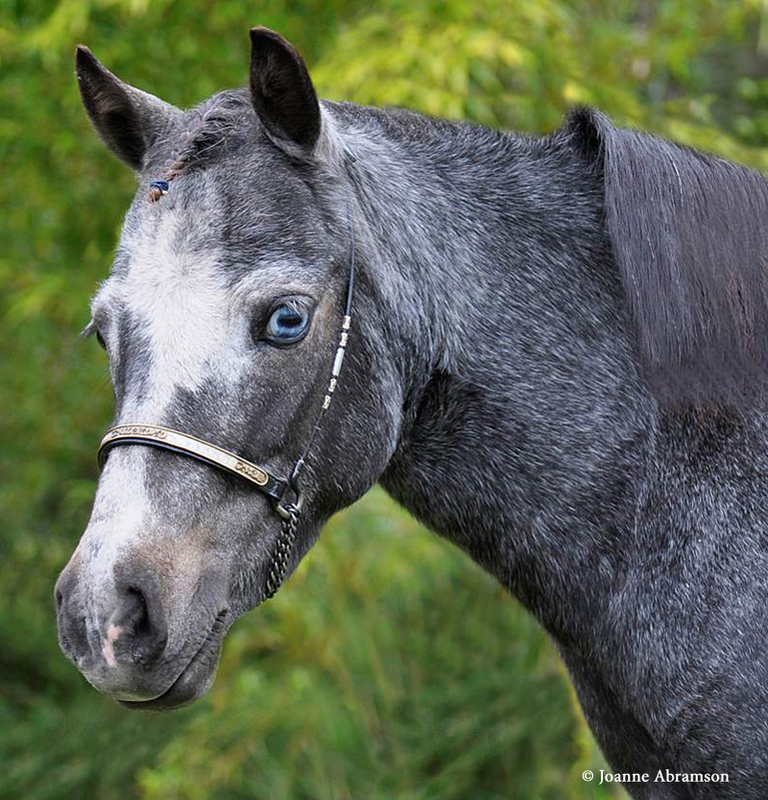 As can be seen in that photo, he has a number of blue flecks in that eye. His iris also has irregular patches of golden brown and darker brown, giving the whole eye a marbled look. Although it was more visible in brighter light, even without the light directly hitting the eye the blue areas could be seen. He would be an interesting horse to test for splash white. So far a couple of individuals without white markings of any kind have tested heterozygous classic splash white (SW1). Perhaps Dutch carries SW1, too. It is also possible that there is some other yet-unknown cause for the blue sections in his eyes. Just a little administrative stuff here. When I started this blog, what I had in mind was a place where people could talk about topics covered in the Equine Tapestry books. There is a lot of information in the first volume of the series, and more to come in the subsequent ones (I say this as I eye the huge stack of notes about pony breeds sitting here beside me), but even so only a fraction of the information is in the books. I though the blog could serve as a place to share that extra information, if it was wanted, but in many ways it has taken on a life of its own. I wanted a conversation, and I certain have gotten that. I just did not expect it to reflect my own rambling, subject-jumping speaking habits quite so closely! But it is a conversation, and I encourage readers to participate. Feel free to leave a comment here on the blog itself, or send a message through email. 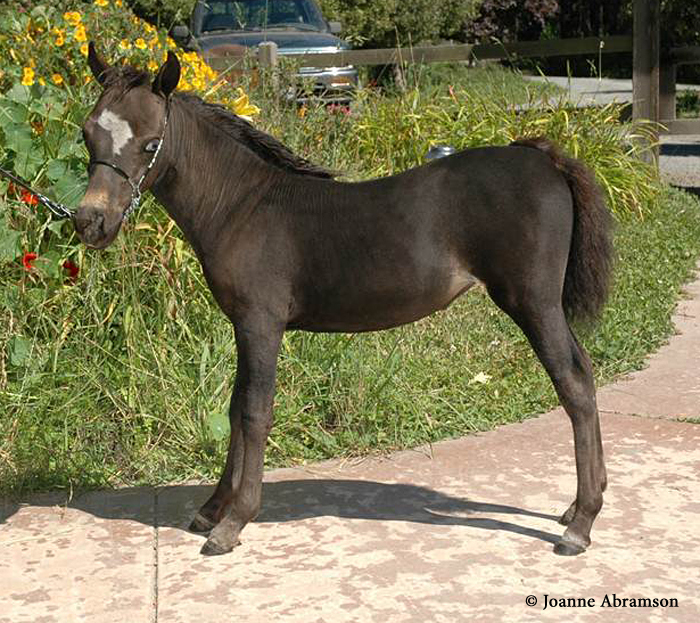 You can find that by clicking the sabino horse image under the “Contact Me” button. Questions, observations, photos and links are always welcome. Sharing these makes for a richer experience for everyone. I also encourage those who participate on Facebook to “Like” our page there. 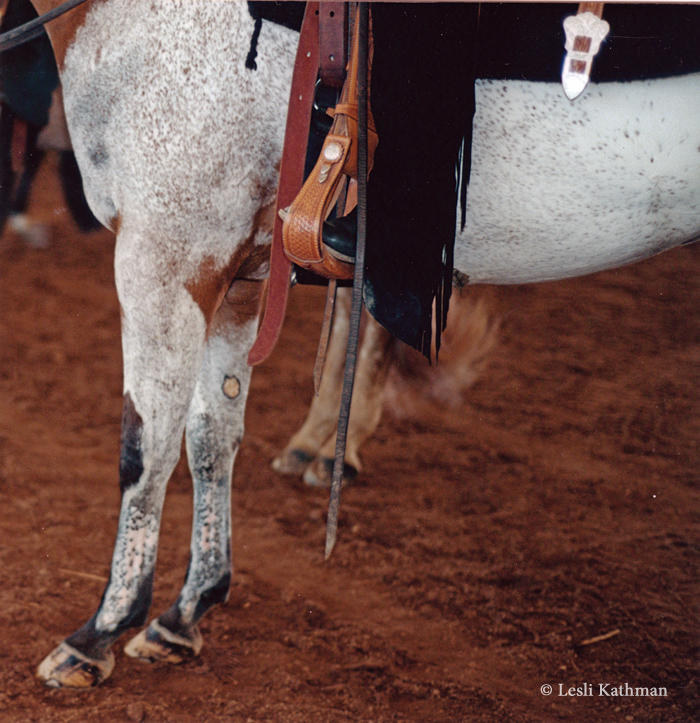 Because I am pretty strict about photo permissions here, and because WordPress is not set up for easy back-and-forth sharing of pictures, many readers use the Facebook page to link to interesting horses online. From time to time the subjects covered here get expanded upon over there. (I do have a personal Facebook page, but it is usually filled with terribly mundane comments about my family members rather than interesting images of horses.) Clicking on the image below will take you to the page for Equine Tapestry. 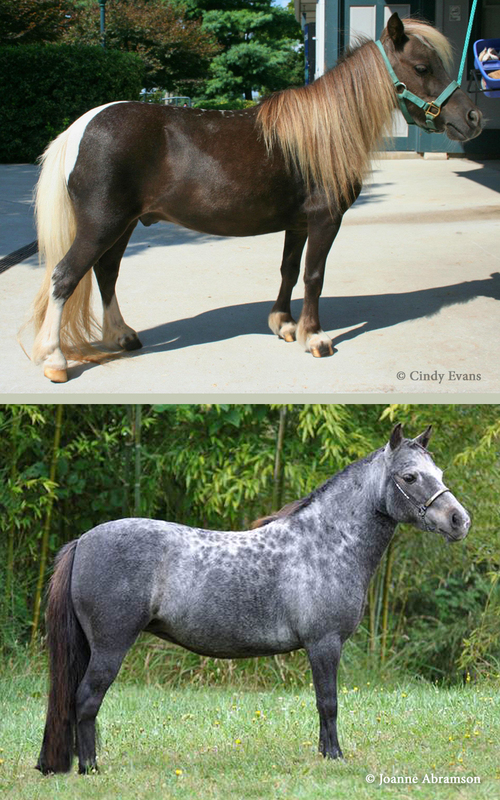 I also keep a set of Pinterest boards with collections of links to unusual horses, all sorted into categories and, in some cases, testing status. I need to add to them, but Pinterest is a terrible place for encouraging time-wasting, as the completely unrelated boards full of recipes I will not make, and home decorating projects I will not start, would suggest. 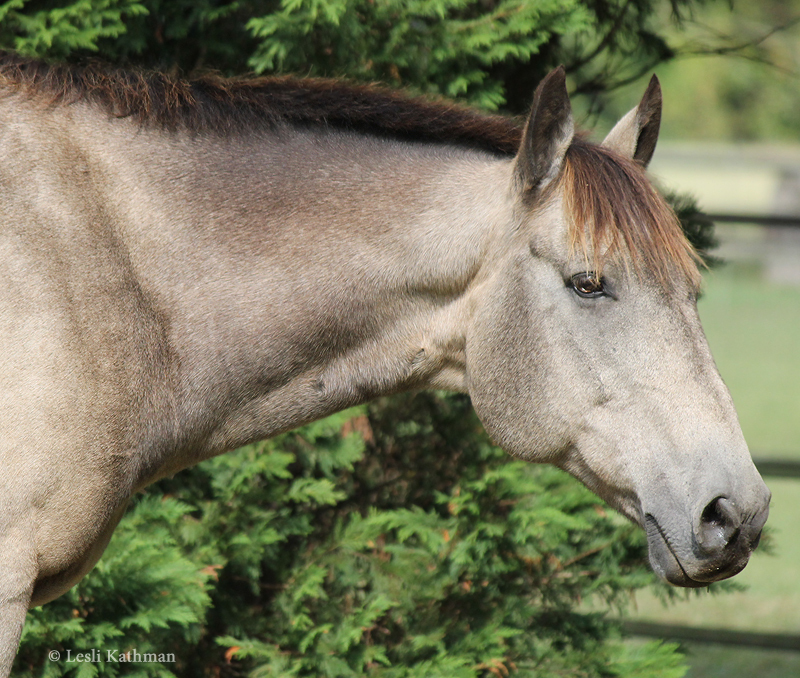 Separating out those personal boards and putting together an exclusively horse color Pinterest account is on my list of things to do, but that is a long list! Clicking on the image below will take you to the boards. As a final note, I have some updates on the books themselves, but I will handle that in a separate post. In the comments section of the last post, some posters noted the similarity of the white areas to fleabitten grey. 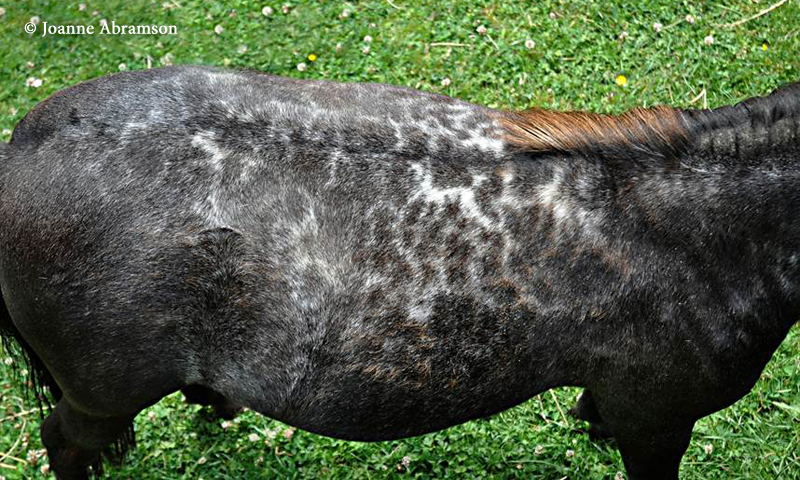 That is not an uncommon thing with appaloosa patterns. 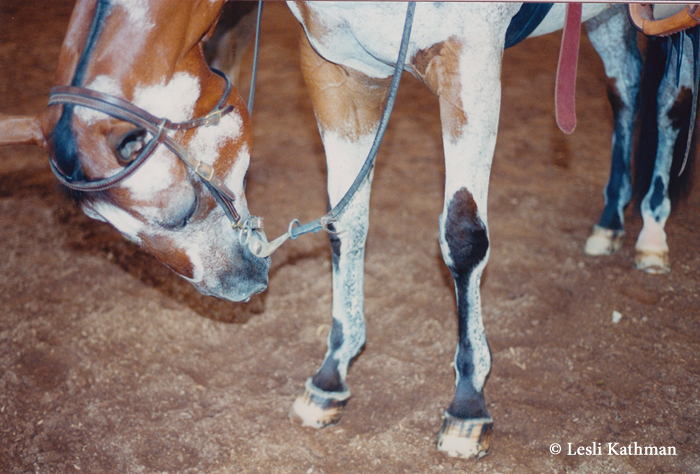 Although it is easiest to think of the action of Leopard Complex (Lp) as a form of progressive roaning, where white hairs gradually replace the colored ones to form what American horsemen call varnish roan, in actual practice the process can go both directions. 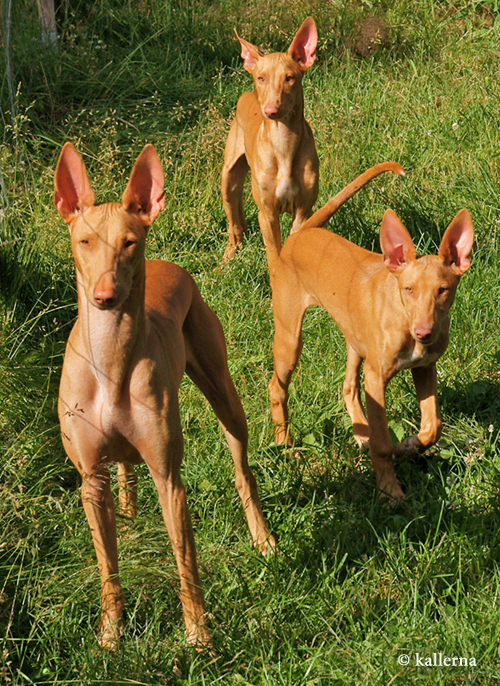 That is, it can add white hairs to lighten the coat, and it can add concentrated bits of color to speckle the coat. 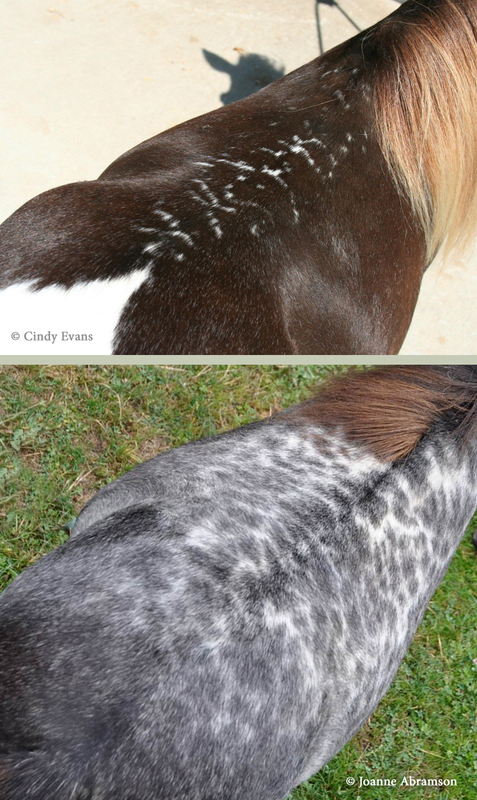 These darker hairs are sometimes called repigmented spots because they typically occur after the coat has already begun to roan out, or in an area that previously had white patterning. Here is Freckles as she appears now. 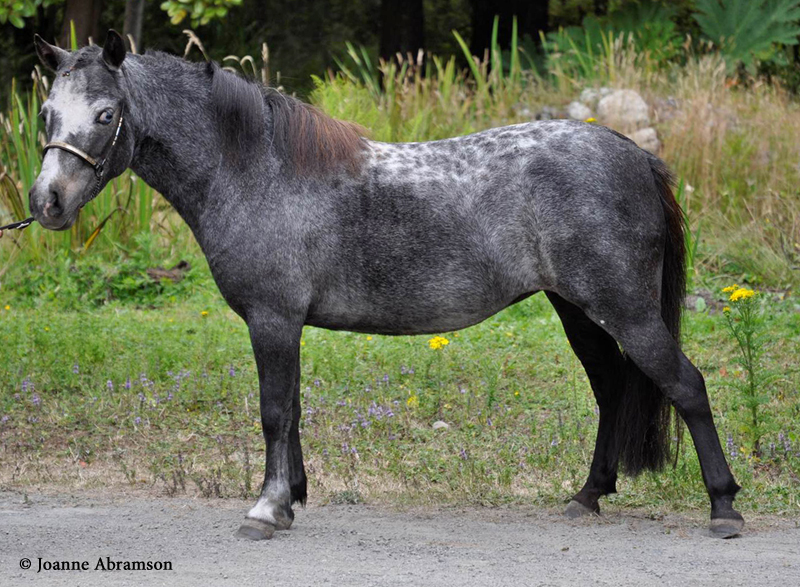 Each year she has gotten more pronounced dark ticking in the roaned areas of her coat, even as she gets lighter in the areas that were colored. 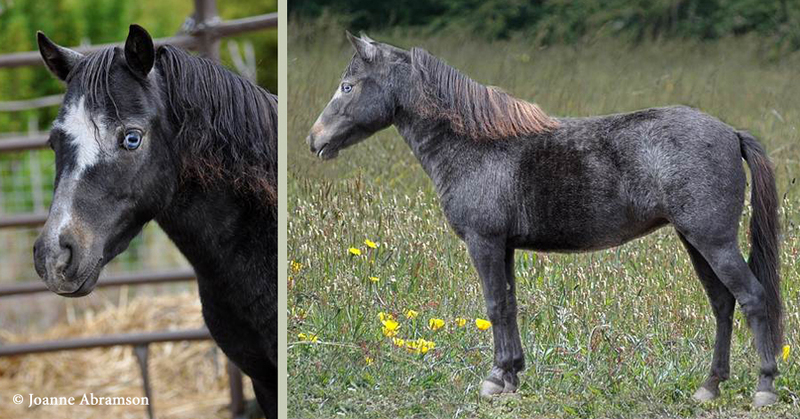 This lighter ticking is most noticeable if you compare the right hind leg in the two pictures. The repigmented specks first began to appear on her shoulder, but over time they have spread across most of her body. 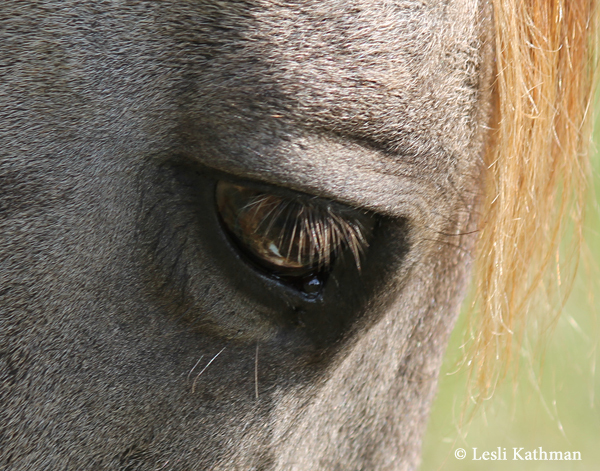 This close-up of her topline shows just how closely this resembles fleabitten grey. In fact, if I use Photoshop to remove the hip spots and what remains of her varnish marks, the resemblance to a true fleabitten grey is quite striking. 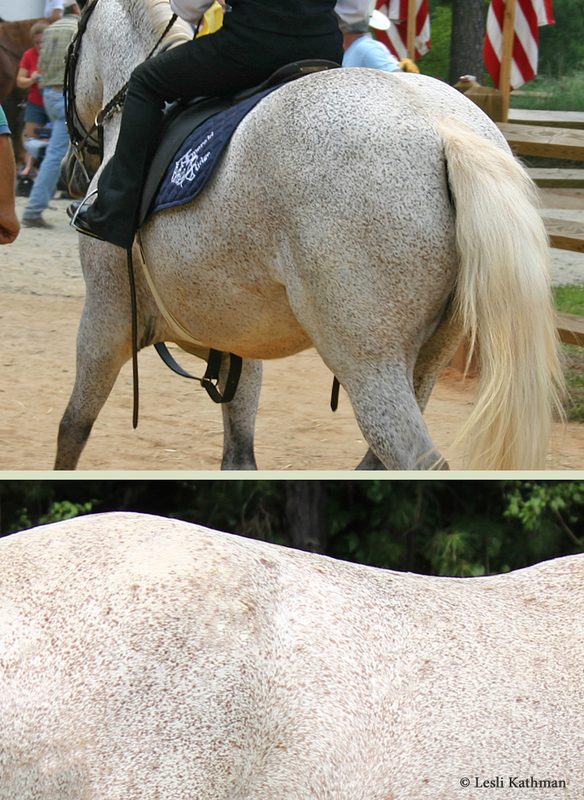 I suspect some type of repigmenting is part of what was going on with the roaned areas on the horse in the previous post. With Freckles, the flecking ties visually with what is already going on with her coat, so it looks less jarring. 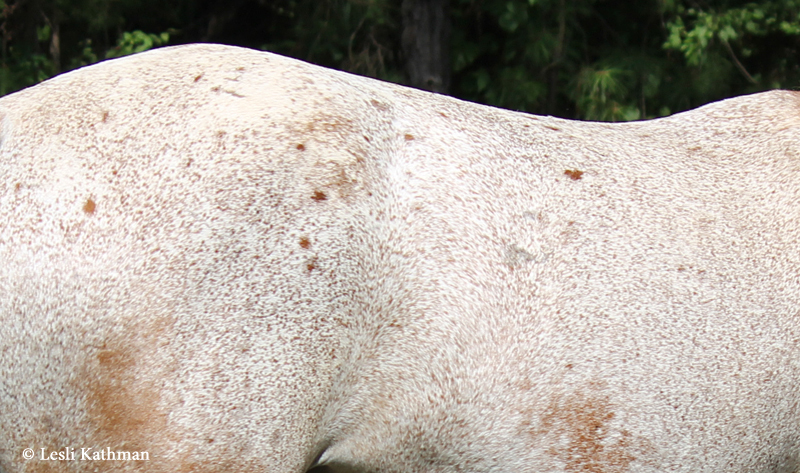 With the horse from the previous post, the odd transitions between his colored areas and the patterned areas make him look a bit like you pasted together parts of a bay appaloosa and a fleabitten grey. 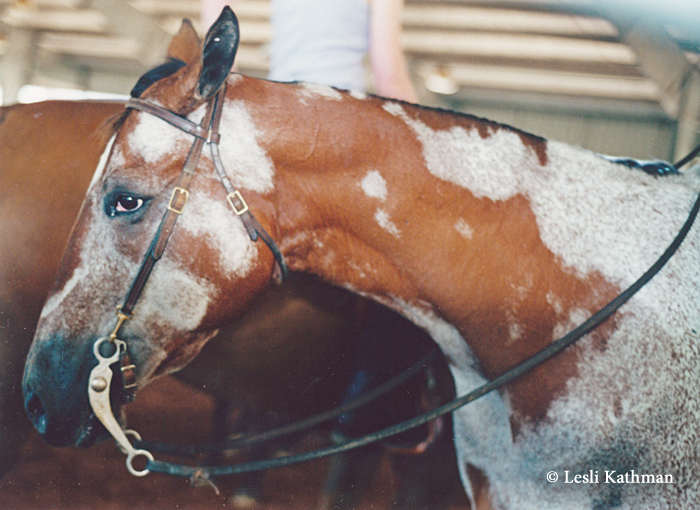 While searching through some old binders, I found some photographs of an unusual Appaloosa pattern. I apologize for the rather poor quality of the images, which were taken in a poorly lit arena using a traditional (non-digital) camera. I’ve tried to bump up the brightness without losing too much in the way of detail. Apparently the horse was never in the right position to get a good side shot, which is a shame. He caught my eye because of how abruptly his coat transitioned to the dark areas of his pattern. Also unusual was how rounded the edges were. This is especially visible on his face and neck. 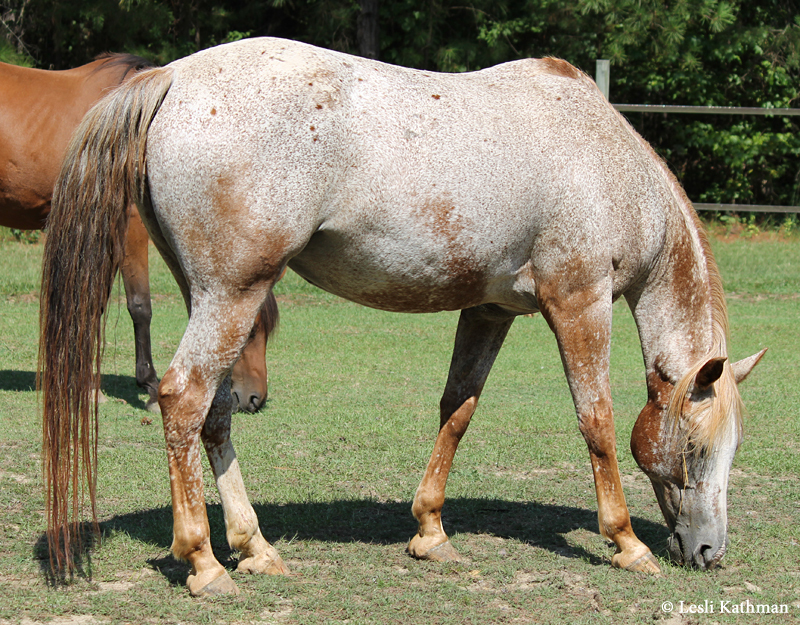 The other unusual aspect of his pattern was the “bleached edge” effect on some of the roaned areas. 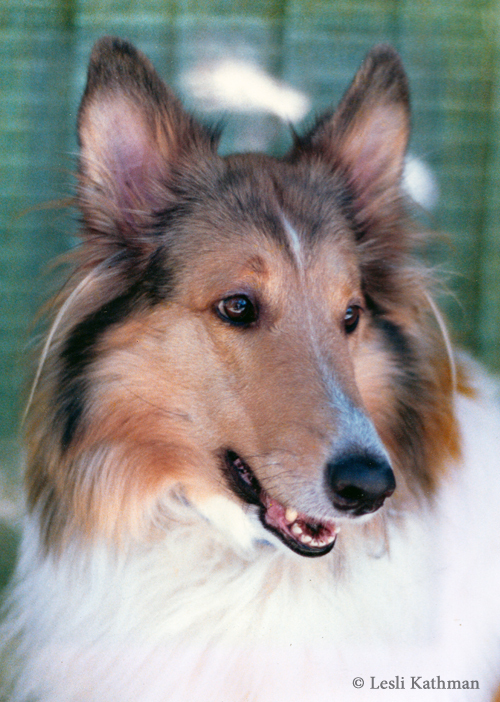 You can see one on the bridge of his nose, both in the picture above and this one from the front. The above shot also shows how the roaned areas appear to “pool” around the dark parts of his legs. Dark leg marks like this are pretty common on appaloosas, but the nature of the roaning, which looks a lot like fleabiting on a grey, all in discreet areas (with those oddly rounded edges) while areas of relatively clear bay remain is quite odd. If this was an artistic representation, and not a real horse, I would have said the artist needed to work on more realistic transitions on the legs. 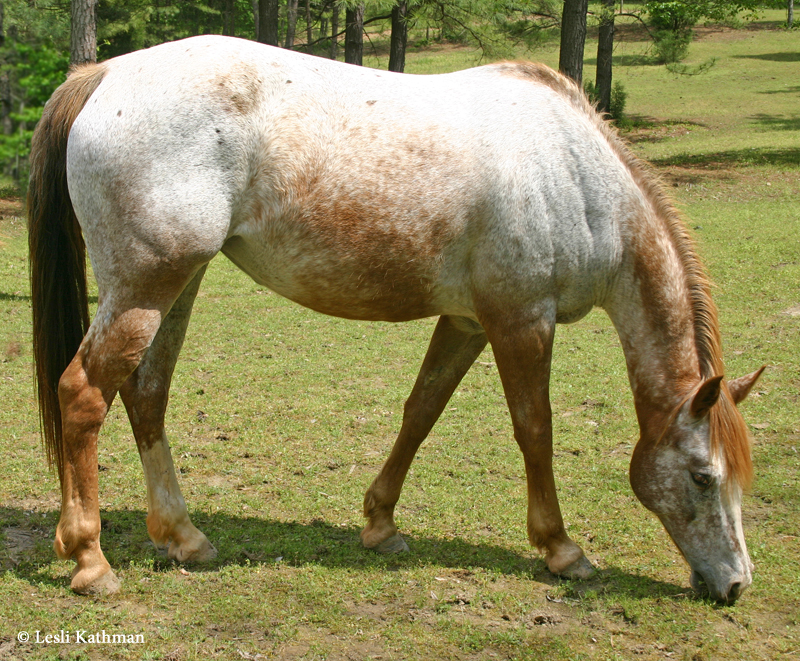 On both the leg shots, the faintly whiter outline on the roan areas can be seen. 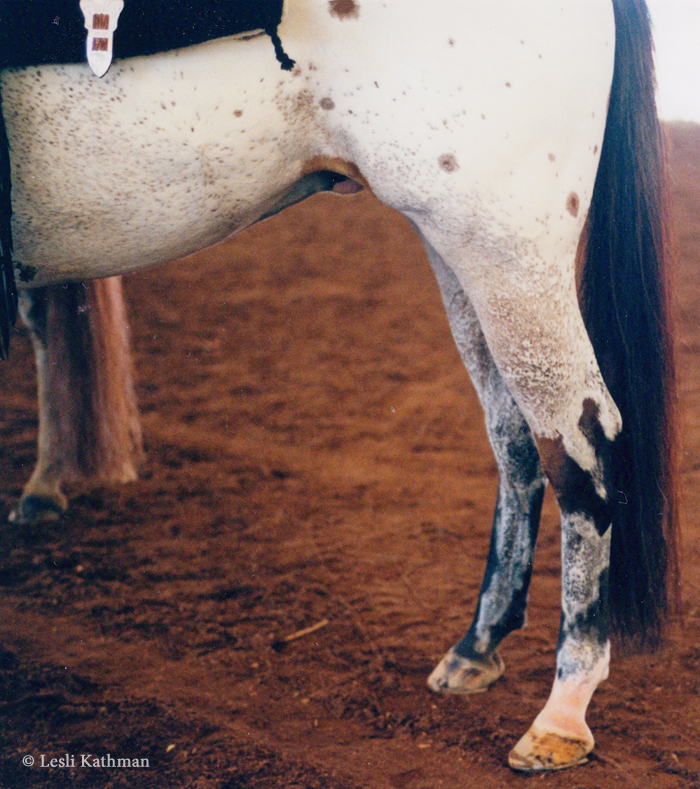 The blanket pattern on his hindquarters, though, is pretty normal. I’ll include a close shot, since the spots show a really nice contrast between the two different types of halo-spotting. 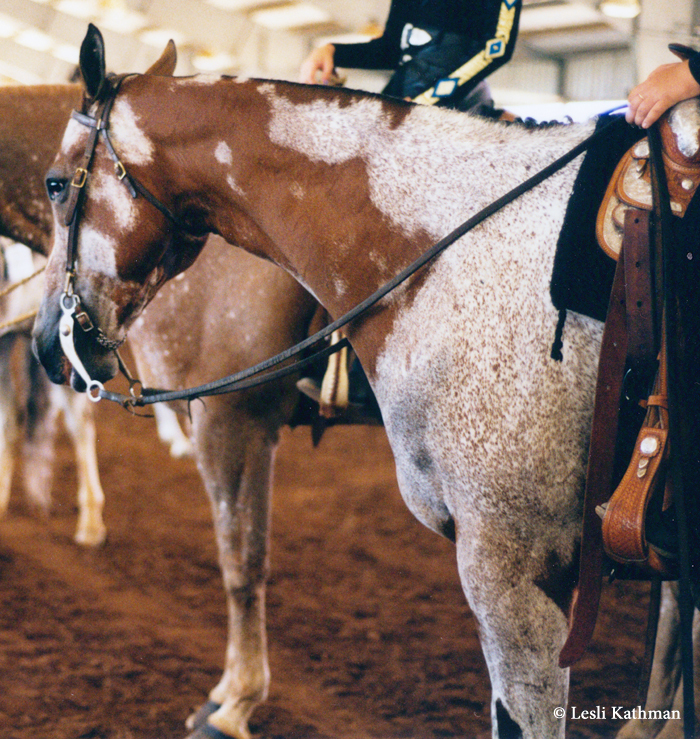 The darkest spots have halos that are made up of a mix of white and colored hairs, while the centers are colored. The centermost spot has a halo created by dark skin underneath white hair. The center of that spot is a mix of white and colored hair, though elsewhere there are spots that have dark skin halos and purely colored hair centers. These photos are probably close to 15 years old now, and I never did learn the name of the horse. If anyone recognizes him, please drop me a note. I’d love to be able to look into his background.